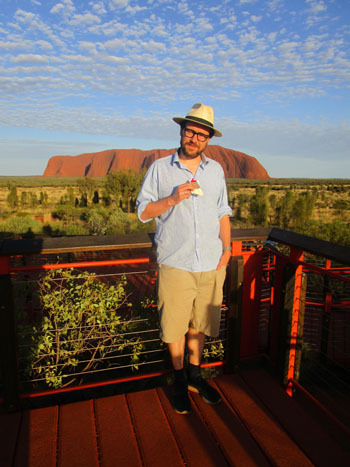 Above: Jame Witt with the Christmas Love Sock at Uluru/Ayers Rock, Australia. Right: Tristan Christmas Love Sock at Uluru/Ayers Rock. We just wanted to let you know that the TDC Love Socks arrived two weeks ago and James absolutely loved them (it was his Woollen Anniversary present). We live in Sydney but last week we travelled to the Red Centre of Australia where temperatures were over 42 degrees Celsius. 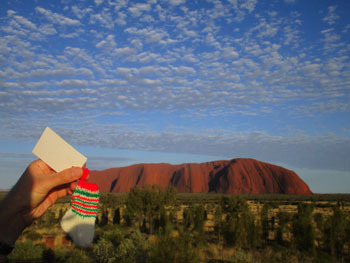 Please find attached two pics of Ayers Rock and our little Christmas Love Sock which came with us. Sincerest thanks to Anne Green for this beautiful thing which we will treasure.